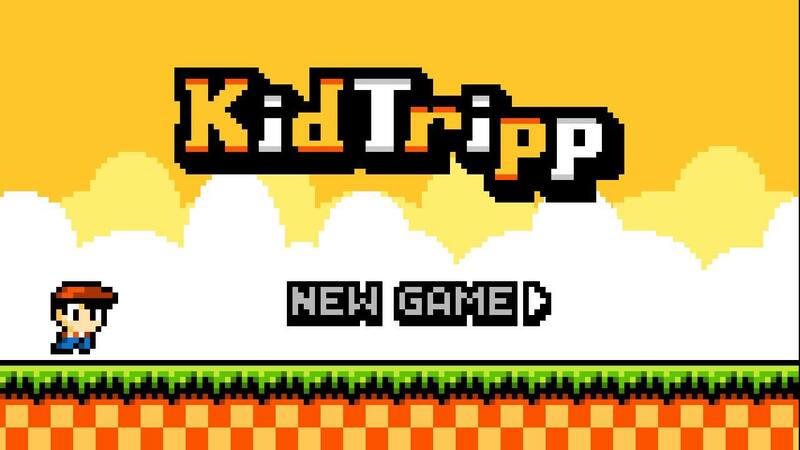 Kid Tripp is an endless runner style game with lots of old school charm. 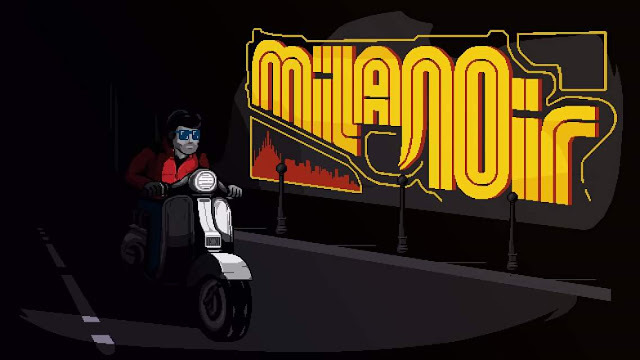 Its pixelated graphics, intense difficulty, and infectious chip tune inspired soundtrack harken back to the good ol' days of the NES and Sega Master System. This was a time when a game's length came not from it's exorbitant amount of content, but by being so difficult that you needed to learn all of the stages' intricacies and enemy patterns to make it through the level. Speaking of which, this game has amazing level design! You quickly learn that you'll need to time your jumps just right to make it through the level, and you'll have to be just as precise when targeting an enemy headstomp. When I first started playing the game, I had no idea that I had the option to throw rocks, and almost gave up on the game because getting by the first monkey was nearly impossible until I figured that out. Since then, I've figured out other ways around the monkey without using the rock, but it was really frustrating to think that a game had beaten me on the third screen. There are coins to collect throughout the stages, and these serve the same function as coins in the classic Super Mario Bros. games- you gain a life for every 100 that you collect. 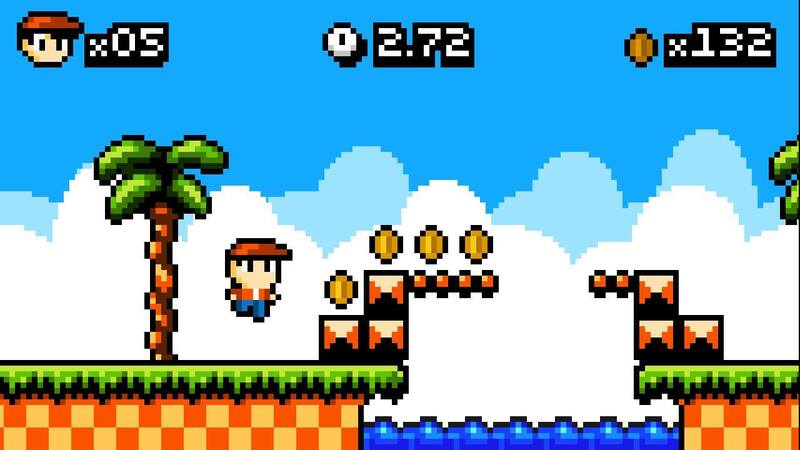 They are also used to either test your ability to navigate the level, or lure you into a pitfall/enemy projectile. 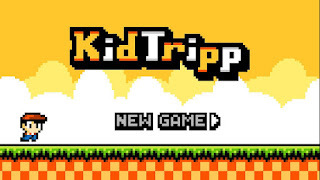 Kid Tripp's controls are interesting in that there are various buttons for the only two functions- jumping and throwing your rock. So, you can really play the game to your own personal preferences, including one handed play. Being an "endless runner" type of game, it automatically moves you forward without a button press. This obviously leads to frustrating situations where you really wish that you could just stop moving or backtrack...but it's not too dissimilar from many classic video games that wouldn't let you go back to the left. 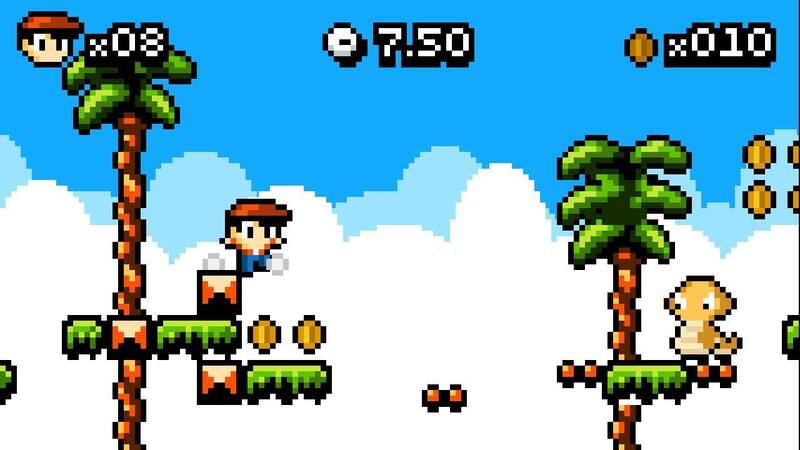 Overall, the game is a fun little package, and it definitely requires multiple failures to learn when you need to jump or throw your stones to clear the path. The clever level design does also offer some moments of rest amidst the onslaught, since you'll sometimes encounter blocks that stop your Kid from moving forward. 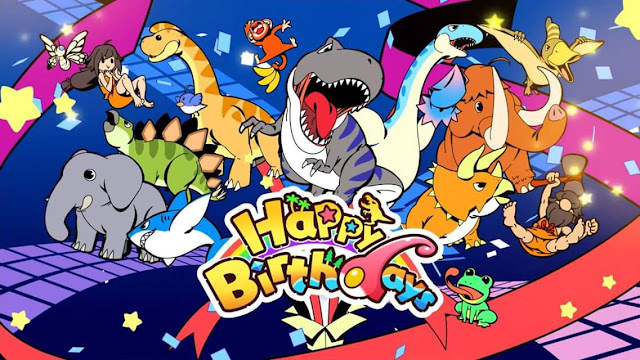 For $3.99, you get plenty of play time, and the game is also available on 3DS.